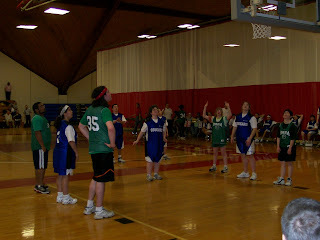 Last year, my wife, Mary, invited me to a Special Olympics basketball practice out in Worcester. It was a week or so before the Special Olympics Winter Games. I had been invited before, but the events always seemed to come on the weekends that I was working. Last year I was free to go, and I am so glad I did. My step-daughter, Jen, has been a member of the Worcester Area Special Olympics for some time. She and her mom have been involved in basketball in the winter, and softball in the summer. I knew little about the games, just a little history of the Special Olympics themselves. Back in 1962, Eunice Kennedy Shriver set up a summer camp for kids and adults with intellectual disabilities at her home in Maryland. In 1968 the First International Summer Games were held in Chicago, and 1971 the Massachusetts Special Olympics was founded. The games have grown ever since. In 2003, 7000 athletes from 150 countries participated in 21 different sports. I attended the Winter Games last year at Clark University in Worcester, and this past weekend I attended the games again on Sunday. It was an event that I will always remember. This past Friday evening The Winter Games 2009 started at the home of one of the other participating families with an opening ceremony, and great night together for the kids and their families. 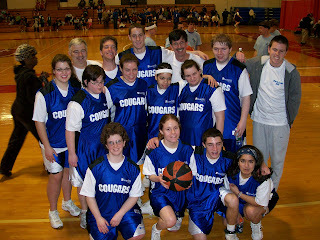 The following day, on Saturday, the team, the Cougars, played two games against other Massachusetts teams. That night they celebrated the Olympics at Mechanics Hall in Worcester with a dance, and a chance to mingle with others at Olympic Town. Mary and Jen came back to Sturbridge after the games, rested up, grabbed a bite, and then headed out again for the dance. That nigh they slept fast, because the following morning we all had to be at Clark by 8:00 AM. Both games for the Cougars were in the morning, followed by lunch for the athletes. When we arrived at Clark University we grabbed some bleacher seats in front of one of the four courts being used for the games that day. I have to admit, I was blown away. First of all, my expectations were shattered last year when I attended my first games. This year, with my expectations in a different place, I went to support Jen, and her team, and to watch some great basketball, and, as I said, I was blown away. Every kid on the team plays. There is a coach for each team, and about four "partners" on each team as well. The "partners"s are kids about high school age, or a little older, that play on the team, and help the coach out in practices. One of them plays at all times, and they are there to make sure that everyone plays. There is no special treatment, or favoritism. Everyone on the team is treated exactly the same, and has the same opportunities as the next player. The partners don't really have to actually enforce this, though. The players all know it. There are no prima dona's, no "stars", only players having fun. The ball is passed to others that have a better shot, and everyone revels in a persons success at scoring, but it is immediately back into the game. No showboating on this team, or any other team I watched during the games. Everyone is equal. Everyone is given a chance to play, and all the players respect each other immensely. Far cry from the high school basketball I watched as a kid. There are winners and losers at each event, but no one dwells on loosing a game or two, or even winning a few. They enjoy more the art of the game, the camaraderie, and the competition itself more than the final score. Another lesson handed to me by the athletes. Yesterday, after the games, and while the athletes were having lunch, one of the partners, Nikkie, announced to the room, that she had something for each of the players. As she spoke she began to break down and cry. She explained that this was probably her last year with the team since she was going to college in the fall and didn't know if she could continue on with the Special Olympics while in school. Her tears were genuine, heartfelt, and within a few seconds the players rose from the chairs and went over to her and hugged her in a long thank you embrace. No ones eyes were dry, Nikkie's, the players, the families, and mine didn't escape. She gave each of the players a card with a note inside to each one of them. As she looked for each face to match the name of the card, she continued to talk, her voice cracking, the tears falling, and being stopped along the way by hugs from everyone. The Special Olympics does a so much for these kids, and adults, but it the things that aren't readily obvious to the rest that are the most remarkable. The players mutual respect for one another that transcends their abilities, the acceptance that one may have keener aim, but another may have more patience, and other may have a steadier hand. Each skill that they may posses is realized by all and comes together to make a team. This attitude comes from the example set by other team members, the coaches, and the partners. This is truly team play. I've heard of a team being truly for themselves as a team, and not for individuals on the team, but until last year I had never seen it in action. It was if it was all second nature, an unconscious behavior of the athletes. Something that was just the way it was, and should be. The right way. This is something I should have experienced many years ago, and learned, but it took a team in Worcester to expose this middle aged man to the number one fundamental of athletics: playing as a team. I can't wait for next years games, but most of all, I can't wait to see those kids again. They are a "shot in the arm", and I seem to need a dose of what they have to give every year about this time. Link to video of the Cougars playing at Clark University.